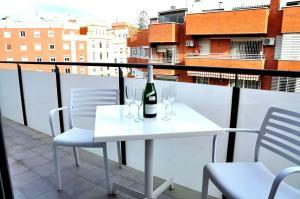 Sensation Authentic Gracia is a self-catering accommodation located in Barcelona. Free WiFi access is available in all apartments. The property is a 10-minute walk from Gaudi's La Sagrada Familia. Accommodation will provide you with a TV and air conditioning. There is a full kitchenette with a dishwasher and a microwave. 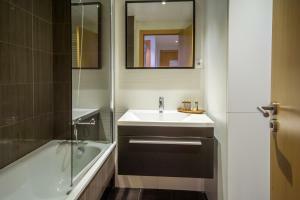 Featuring a bath, private bathrooms also come with a hairdryer and free toiletries. All properties include a private balcony with chairs and tables. Bed linen and towels are provided. 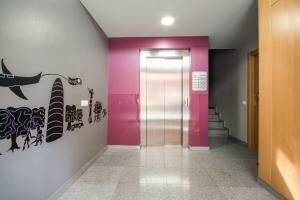 Joanic Metro Station is a 5-minute walk away, and you can reach Plaça Catalunya and the centre in 15 minutes by metro. You can reach Gaudi's La Pedrera in 20 minutes by metro, and Barcelona-El Prat Airport is located 16 km away. If you expect to arrive outside check-in hours, please inform Sensation Authentic Gràcia in advance. You can use the Special Requests box when booking or contact the property. A surcharge of € 30 will be applicable for late check-in after 22:00. Late check-out cannot be guaranteed prior to arrival and must be arranged with Sensation Authentic Gràcia. Final cleaning is included in the price. The apartment is cleaned once, free of charge, for stays over 5 nights. This modern apartment has 2 bedrooms, a private bathroom, a fully equipped kitchen and a comfortable living-dining area with a flat-screen TV. It also has a balcony. Bed linen and towels are provided. Rate: € 80.00 ... € 206.00; select dates below to get current rates. This modern apartment has 4 bedrooms, 2 private bathrooms and 1 separate toilet, a fully equipped kitchen and a comfortable living-dining area with a flat-screen TV. It also has a private terrace. Bed linen and towels are provided. This modern apartment has 1 bedroom, a private bathroom, a well-equipped kitchen and a living-dining area with a flat-screen TV. It also has a balcony. Bed linen and towels are provided. Rate: € 80.00 ... € 307.50; select dates below to get current rates.